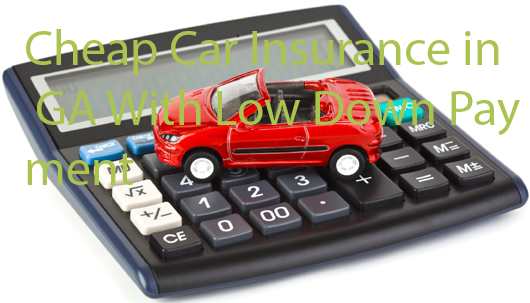 Finding cheap car insurance in GA with low down payment takes some time and effort, but it’s worth it. Costs can vary significantly from one insurer to another, as well as down payment amounts. Currently, Georgia boasts around 6.975 million licensed drivers. These motorists can expect to pay an average of $1,232 per year for their car insurance, depending on what part of the state they live in. For example, Atlanta residents have an annual car insurance cost of $1,616. This is almost $500 more than residents of Valdosta, where the cheapest insurance is found. While many Georgians are paying less than the US annual rate of $1,503, this doesn’t mean they couldn’t find cheaper coverage with a lower deposit, with a little effort. If you are a Georgia resident looking for cheaper insurance rates, it’s strongly recommended that you shop around and get quotes from at least five companies before making a decision. Before you do, there are a few things you should know about Georgia’s insurance and driver requirements. GA drivers are required to have an auto insurance policy with liability coverage, according to the Georgia Office of Insurance and Safety Fire Commissioner. This means that if the driver causes an accident, the basic policy will cover the other driver, their vehicle, and any property or passengers inside. However, it is likely that the costs of repairs, replacements and medical bills will exceed the minimum coverage amount. This is why additional coverage is strongly recommended. Although you’re only required to have liability coverage, if you are GA resident who wants to make certain your property is protected after an accident, you will need to add comprehensive and collision coverage to your policy. Even if you are at fault, this will cover the costs of repaired or replaced property. It also covers car rental charges you may incur while your vehicle is being repaired. Comprehensive coverage also includes theft, windshield damage, fire, and vandalism. If you don’t want to pay high monthly insurance payments, you may want to customize your policy with a higher deductible. This will keep your monthly costs lower, while still allowing you to keep comprehensive coverage. In Georgia, around 12% of drivers are uninsured. This is why it is important to consider adding uninsured motorist coverage. This protects you from the high costs of repairs, medical bills, and property replacement if you are hit by a driver without insurance. Adding it onto your policy only costs a few dollars more per month but can save you thousands if an unfortunate accident occurs. Who Offers the Cheapest Car Insurance in Georgia? As an added bonus, Georgia is one of several states that offers no down payment car insurance. This allows you to start your coverage by paying your first month’s premium. You have two options for making the rest of your car insurance premiums. 1. You can make a large quarterly, semi-annual, or annual payment. 2. You can make monthly payments. Keep in mind that a monthly payment plan may work best with your budget, but it may end up costing you more in the long run. Insurance companies offer discounts to those who can pay more of their policy upfront. In other words, the more you pay upfront, the less you’ll pay in the long run. Do You Qualify for No Money Down Car Insurance in Georgia? Insurance companies take on the risk of insuring your vehicle as soon as your policy begins. This is why they want to recuperate some of their risk with your initial payment. This is also why some people may not qualify for no money down car insurance. For example, if you are in any of the following categories, you may not be able to find no money down insurance. ⦁ You own a newer, expensive car. Companies are taking on a higher risk when they insure new, expensive vehicles. ⦁ You have a poor credit history. ⦁ You are required to file an SR-22. On the other hand, if your car is older or less expensive, you are more likely to qualify for zero down payment car insurance in Georgia. Progressive insurance is one larger insurer that offers low down payments and zero down policies. They also have some of the lowest rates in GA. Other carriers that offer low down payments include Geico, Esurance and Farmers Insurance. Enter your zip code and compare the lowest direct rates online. In GA, motorists 15 years old and over can obtain an Instructional Permit, allowing them to learn to drive. A parent or legal guardian must sign the application. The applicant must pass a knowledge and vision exam. Once the permit is issued, the applicant is only allowed to drive when accompanied by a licensed driver age 21 or over. An Instructional Permit is good for two years. In Georgia, the Class D Provisional License has the following restrictions. ⦁ The license cannot drive between the hours of 12 am and 6 am. ⦁ For the first six months, the licensee can only have “immediate family members” as passengers. ⦁ After the first 12 months, no more than 3 passengers under the age of 21 may accompany the driver, unless they are members of the licensee’s immediate family. ⦁ Passing a vision exam: To pass the exam, the driver must have a visual acuity of 20/60 with or without corrective lenses. The driver must also have a peripheral vision of 140 degrees. Applicants who do not pass the Knowledge Exam or also fail at the Road Skills Test must wait one day before retesting. Additional failures mandate drivers to wait seven days. Applicants who fail because of an accident or traffic violation are required to wait 30 days to retest. A regular Class C drivers license with a 5-year expiration date is $20. For an 8-year expiration date, the fee is increased to $32. Having a DUI/ DWI on your driving record will definitely increase your car insurance costs. According to GA law, the BAC limit is .08. If you are convicted of a first offense and you are between the ages of 16-20, your license will be suspended for 6-12 months. You will also have to pay a $210 fine in addition to mandatory DUI school attendance. If you are over 21, your license will be suspended for a period of 120 days, to one year. You are also required to pay a $210 fine and attend mandatory DUI school. If you are convicted of a second offense within 5 years and you are between the ages of 16-20, your license will be suspended for 18 months. You will also be required to pay a $310 fine, obtain a mandatory clinical evaluation and treatment, attend DUI school, and have an interlock suspension in place between 120 days to 1 year. The same stipulations apply to you if you are21 or older. If you are convicted of a third offense in 5 years and you are between the ages of 16-20, you will face a 5-year license suspension. You will also be fined $410. and required to go to DUI school that includes a clinical evaluation and treatment. In addition, you will need an ignition interlock device for a minimum of 2 years. If you are 21 or older, your license will be suspended for 5 years. However, you may also have your license permanently revoked in addition to hefty fines and mandatory classes. Of course, your car insurance premium is sure to increase with every DUI conviction. With the second offense, it may not be possible to get insured in Georgia. Georgia has banned all cellphone use for all drivers. This includes texting. If you are convicted of texting and driving, your insurance premium may increase substantially. Southern etiquette is legendary in Georgia. It even applies to drive. For example, if you are driving and come across body parts from a traffic accident, you are specifically prohibited by law from selling them. Crazy, right? When you are looking for cheap car insurance in Georgia with no down payment, don’t forget to find out if you qualify for any of the following discounts. Compare online quotes in less than five minutes. To get started, just enter your zip code.